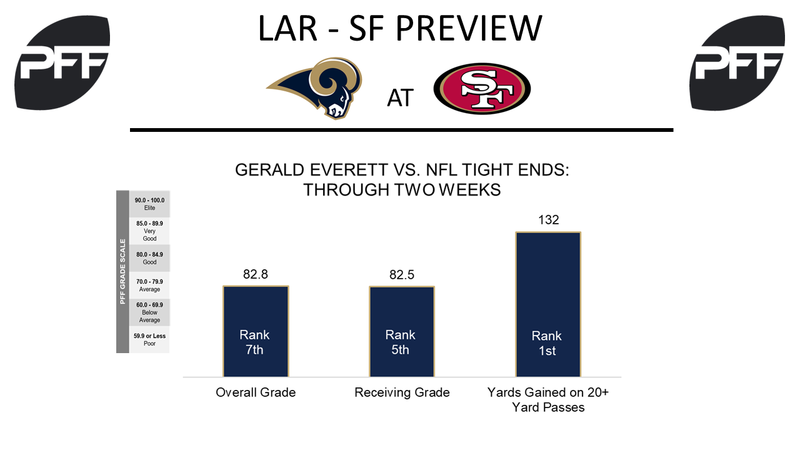 TE Gerald Everett 49ers Safeties – Through two weeks of the regular season, rookie tight end Gerald Everett leads the Rams’ offense as the highest graded player with an 82.8 overall grade, which is also seventh among 60 NFL tight ends. Everett’s has seen four targets in two weeks, most among Rams tight ends, and has caught all four of them for an average of 33.5 yards per reception. In his Week 3 matchup with the 49ers, Everett will see a safety group who have seen veterans Greg Olsen and Jimmy Graham in the first two weeks and held them to a paltry 19 yards on four targets and a pass defended. Three of Everett’s four receptions have come on go routes, which he has taken for 132 yards, while 17 of the yards allowed to tight ends by the 49ers safeties have come on a go route. HB Todd Gurley vs. 49ers Tackling – Against Washington, Todd Gurley’s overall grade of 79.6 was the highest grade he has produced since Week 6 of the 2016 season. His seven-combined forced missed tackles in both the running and passing game are tied for seventh among all running backs and now he faces a 49ers defense that has combined to miss 20 missed tackles. They are one of only six teams to have 20 or more missed tackles through two weeks, and 18 of those have been against opposing teams running backs. Look for Gurley to create yards in the passing game, as his 89.0 receiving grade ranks second among all running backs, as does his 107 yards after the catch. WR Cooper Kupp vs. Slot Coverage – Kupp has been heavily targeted by the Rams through the first two games of the season and has been very efficient. His overall grade through two weeks of 78.1 is tied for 16th among 102 wide receivers, while his receiving grade of 80.2 ranks 10th. Of his 42 routes run in two games, 24 of them have come from the slot, where he has averaged 2.38 yards per route run, tied for fourth among wide receivers. He will face a 49ers defense that is allowing 1.27 yards per coverage snap from the slot on 83 overall coverage snaps, though they have yet to allow a touchdown in slot coverage. QB Brian Hoyer on play action — Play action is a hallmark of the Kyle Shanahan passing game, but the 49ers have struggled to find success when utilizing a play fake through the first two games. Hoyer has the league’s worst passer rating with play action (35.9), completing just 56.3 percent of his passes with a 3.1 yards per attempt figure that tops only Blake Bortles. 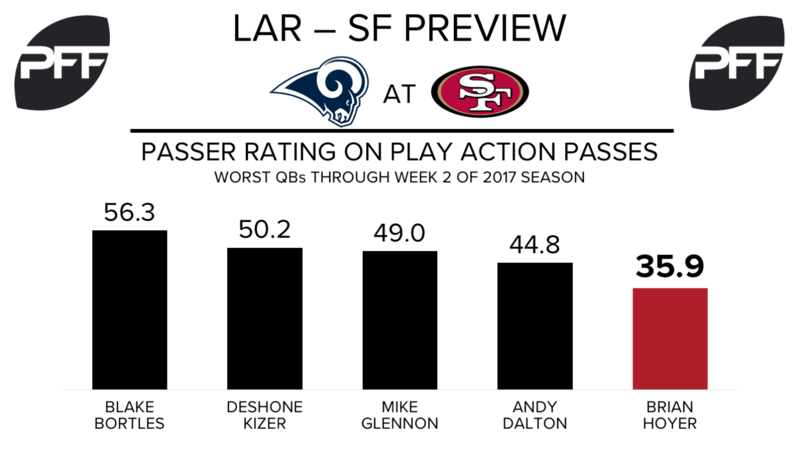 San Francisco will clearly be looking for better results this week against the Rams as they try to get the passing game on track. It’s still an incredibly small sample size this early in the season, but the Rams defense has allowed a completion on all five play-action attempts they’ve faced for 111 yards and a 118.8 passer rating, which currently ranks 27th in the league. T Joe Staley vs. EDGE Robert Quinn — Both players are off to uncharacteristically poor starts this season. Staley has still yet to surrender a sack, but he’s given up five total quarterback pressures on 69 pass-block snaps and his 47.9 overall grade currently ranks 47th among tackles (out of 72 qualifiers). Quinn rushes the passer almost exclusively from the right side (28 of 31 pass-rush snaps on the season) of the defense, but has generated just two pressures (1 sack, 1 hurry) against left tackles and his 6.3 pass-rush productivity from the right side ranks 43rd among 68 edge defenders with at least 10 right-side pass rushes. RB Carlos Hyde vs. Rams front seven — Hyde’s big day in Seattle (124 yards on 15 carries) wasn’t quite as impressive as it appeared on the surface. His 48.3 overall grade in Week 2 ranked 32nd out of 47 qualifying running backs, as he benefited from some solid work up front by his offensive line (a rarity), particularly on his 61-yard run late in the second quarter. Nonetheless, Hyde and this running game has produced in Shanahan’s zone running game against two solid defensive fronts so far. On 21 zone runs this season, Hyde is averaging 8.10 yards per carry (tied for first) and 3.52 yards after contact per attempt (fourth). They’ll face another stiff test this week against Aaron Donald & Co., who allowed 3.46 yards per attempt on zone runs last season (fourth), a figure that is down to 2.68 this year (eighth).